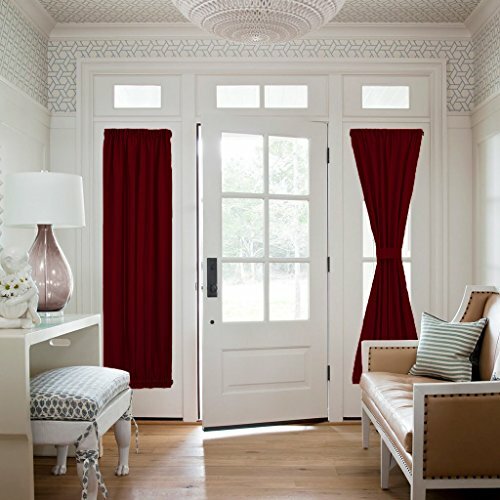 We all love French door curtains for the way they make our doors elegant and welcoming. With NICETOWN BLACKOUT FRENCH DOOR PANELS, there is more to it. Single panel per package. Order 2 if you have double doors. Dual-pocket design on each ends allows you put your sash / rod upon your needs, give the door panel a nice fit. Three different length options let you decide how much light you want to let in. Excellent light blocker thanks to triple weave blackout fabric. Provides absolute privacy for your indoor life. Densely woven fabric makes the door panel an additional sound barrier. These blackout door panels protect your furniture and art pieces from fading when the bright sun streams in. The door curtain is a good insulator of summer heat and winter chill, lowers your energy bill. This solid polyester blackout curtain panel is made to last with minimum caring required. Machine washable. ✅ Tailor-Made: Package contains one (1) door panel that measures 25" wide x 72" length. Bonus: adjustable TIE-BACK. DUO ROD POCKET design on each end gives the curtain a nice fit. Heavy material feels soft on the touch without being bulky.